Description: 1951 Walter O'Malley signed letter with original envelope (EX). 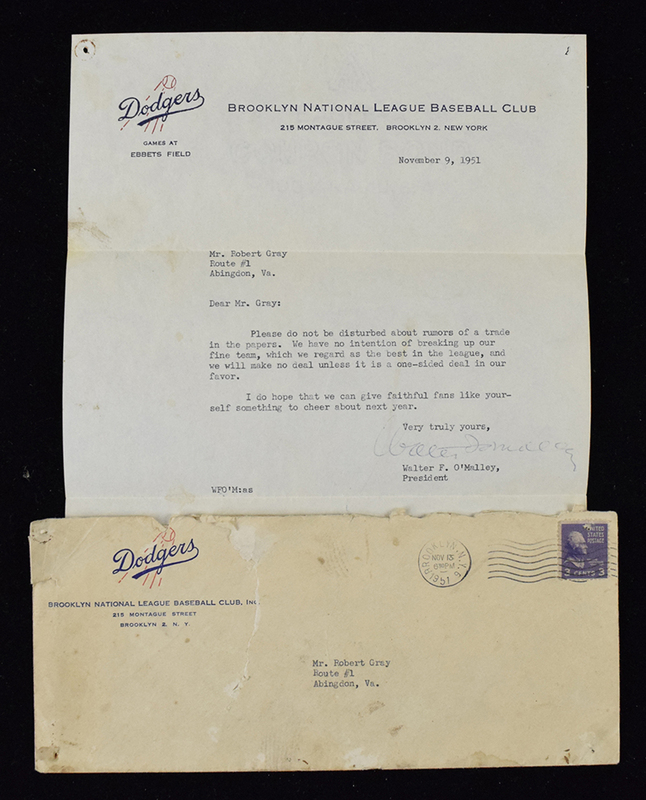 November 9th 1951 typed letter on Brooklyn Dodgers stationery in which O'Malley mentions having "no intention of breaking up our fine team, which we regard as the best in the league, and we will make no deal unless it is a one-sided deal in our favor", etc. O'Malley signed the letter in vintage blue ink. Signature rates 7/8 out of 10 (EX, tack holes at the corners). Includes original Dodgers mailing envelope which has much heavy wear. This item closed at 05/23/2018 at 10:20 pm. No more bids are being accepted on this item.